The output signal indicates the EPS control unit calculation data. The normal values will be displayed even in the event that the output circuit (harness) is open. *1: Almost in accordance with the value of вЂњMOTOR SIGвЂќ. It is not a malfunction though these values are not accorded when steering quickly. *2: A fixed value is indicated regardless of steering turning. *3: Normally displays 100%. In case of an excessive stationary steering, the assist curvature gradually falls. However, it returns to 100% when left standing. *4: It is not a malfunction, though it might not be corresponding just after ignition switch in turned ON. If any malfunction occurs in the system and control unit detects the malfunction, eps warning lamp on combination meter turns on to indicate system malfunction. Under abnormal vehicle speed signal conditions, vehicle speed is judged as constant. 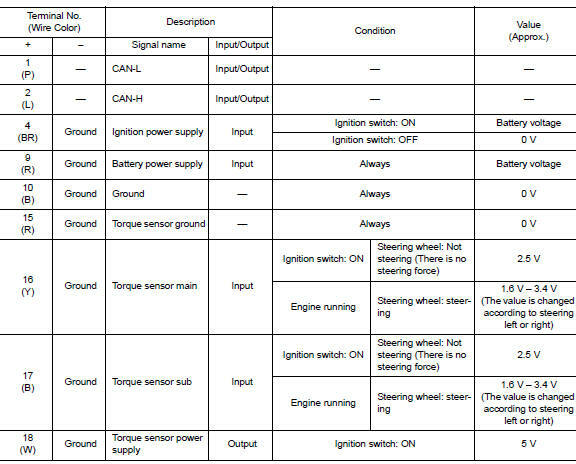 Eps control unit decreases the output signal to eps motor while extremely using the power steering function (e.G., Full steering) consecutively for protecting eps motor and eps control unit (overload protection control). While activating overload protection control, the assist torque gradually decreases, and the steering wheel Turning force becomes heavy. The normal assist torque is recovered if the steering wheel is not turned for a while. When multiple dtcs are detected simultaneously, check one by one depending on the following priority list. 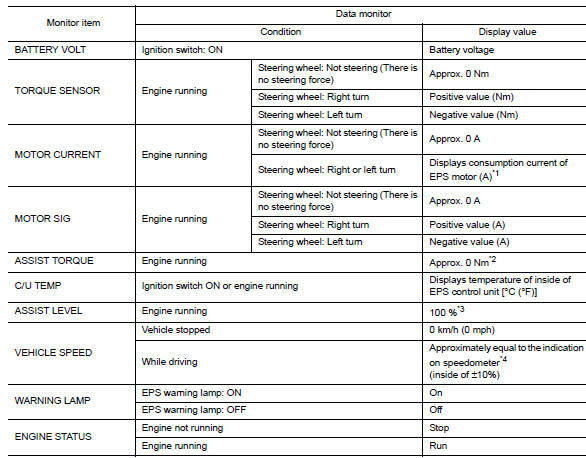 *: Even if dtc is detected, eps warning lamp does not turn on when assist torque is generated.